Some things you never grow out of. 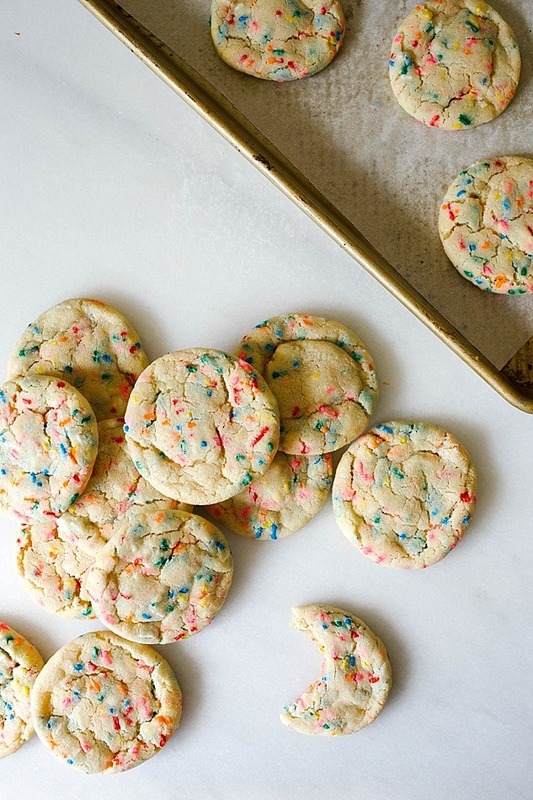 Things like cotton candy at Walt Disney World and flannel on Christmas morning or even treats like these funfetti cookies remind me that there’s a childlike nostalgia in all of us that will never die. Some things are relevant forever. My best friend Jesse turned 30 yesterday. We met as self-conscious 6th graders back in the late 90’s (cough, what? ), and since then we’ve celebrated nearly 20 years of birthdays as BFFs. That length of time does something to a relationship. After a while, you start feeling less like a friend and more like a sister, or maybe a crazy aunt who is terribly overbearing but loyal enough to throw eggs at your ex-boyfriend’s house. Our friendship has evolved over the years and it’s rarely presented itself perfect and shiny like a new penny. But after 20 years, it’s one that is worn in and fits snug in all of the right places of my story. She’s the present that has meshed with nearly ever part of my past, the instant classic that I’ve never grow out of. Last month in Las Vegas. 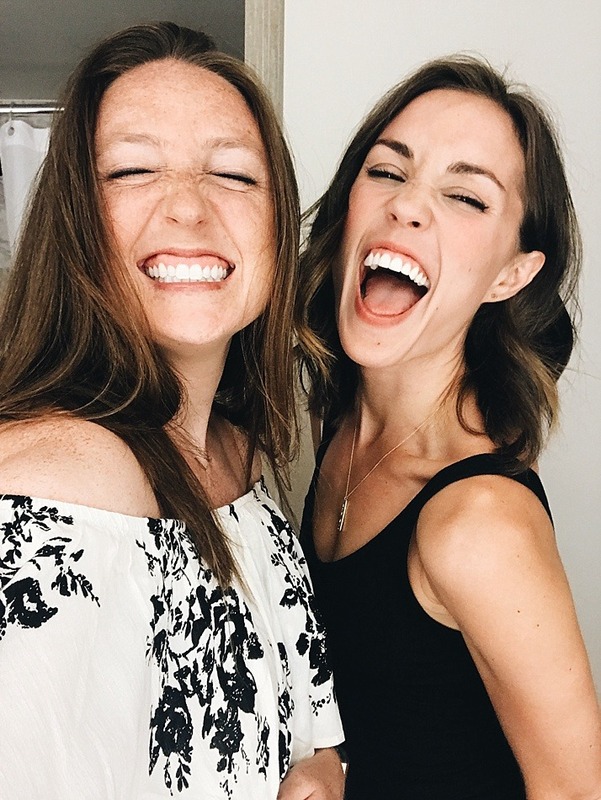 This was right before we went to the Backstreet Boys concert, because, obviously, we love ourselves. When Jesse and I get together, it’s like we’re in middle school again. Instead of sentences, we speak in strings of inside jokes and outlandish “What If?” scenarios. There’s laughter and sarcastic banter, full freedom to say or do whatever feels right, even if that means absolutely nothing at all. There’s a certain vulnerability that comes with spending time with a person who has known you through nearly every season of your life. There’s safety to share secrets and expose the hidden parts you think no one else will understand, because you’re confident that, ultimately, that person is there for keeps. So I find myself from time to time, even as a wife, mother, and almost 30 year old woman, crawling like a child into the lap of my dear friend who I know will always make room for me, no matter what I bring to the table. That, my friends, is irreplaceable. It’s totally cool if I’m not her maid of honor too. Actually, no. I take that back. Not cool. 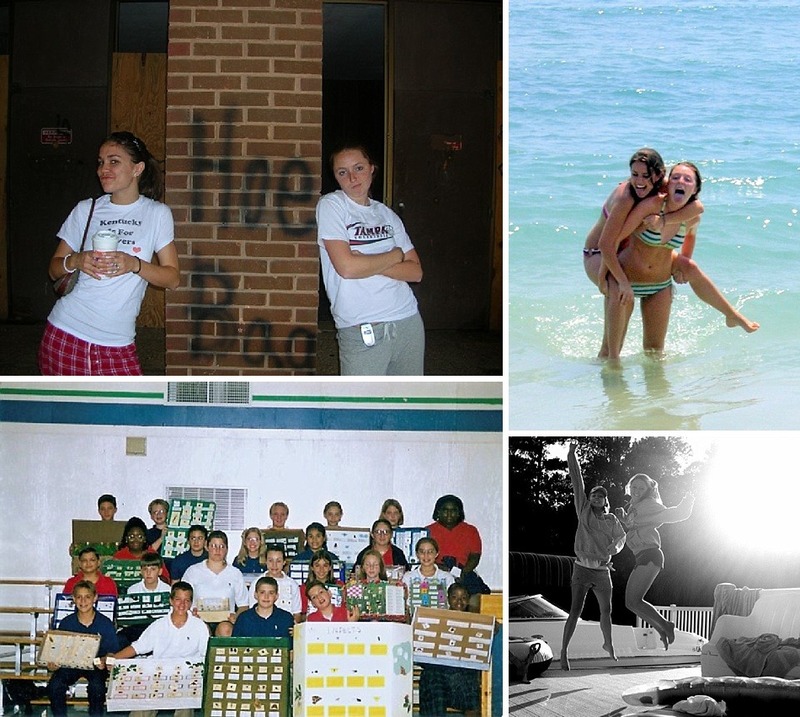 I feel obligated to embarrass Jess (and myself) with a few photos from years past. 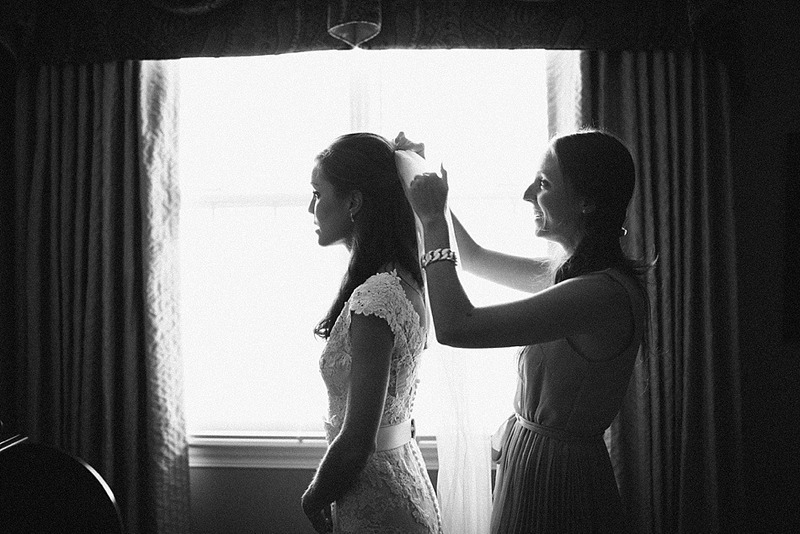 If a girl will stick by you through a half-dozen or so break-ups, braces, AND the unibrow phase, you know she will forgive you for a few old photos. Happy Birthday, Jess. Ride or die forever. This is real life. Yes, we wore the same skirt to the 6th grade dance. Yes, my eyebrows (and hair) really were that big. Orange Beach, Alabama, on the day I got engaged. Jesse surprised me there and photographed the proposal. The photo above was for our bug project in 7th grade. See if you can spot the two winners side by side. Hint: I have glasses, she has her eyes closed. Mercy. 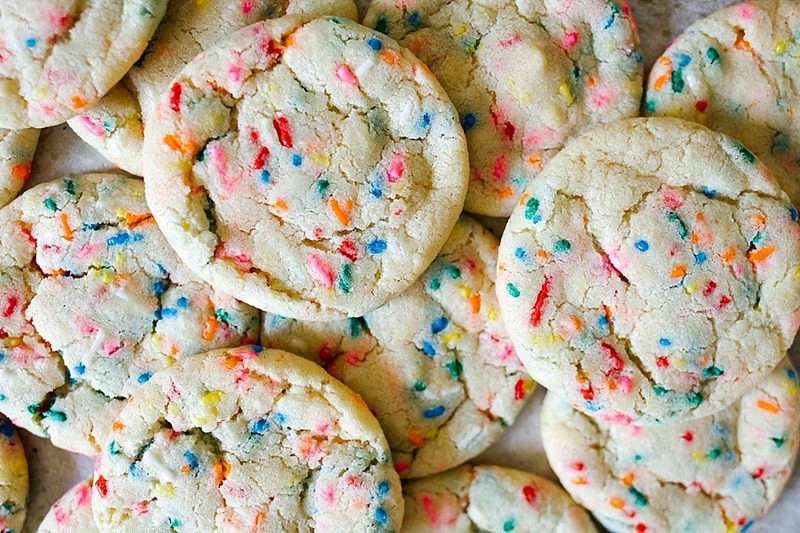 Like an old friend, these funfetti cookies give me all the feelings. You never grow too old for cookies, sprinkles, or the nostalgic delight that comes with the taste of box mix cake batter. These cookies are a simple, a one bowl recipe that bake up chewy, crinkled, and colorful every time. Perfect for the kids you love and the kid in you. To make them, first cream a little room temperature butter with sugar, sugar, and more sugar. Eggs are added for moisture and fluff, and a splash of clear vanilla ensures that the cookies have that delightful bakery taste that we all know and love. Flour and a few other dry ingredients get just barely mixed in before we toss in loads of sprinkles- totally fun and incredibly necessary. 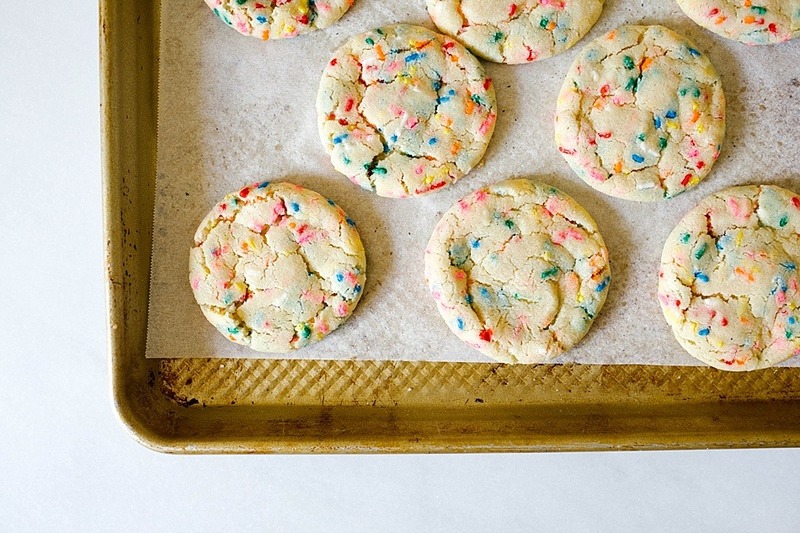 These funfetti cookies bake into perfect little rounds. The cream of tartar helps to achieve those pretty little cracks on the tops, and the high ratio of granulated sugar to brown sugar makes for a crisp-edged, chewy cookie. 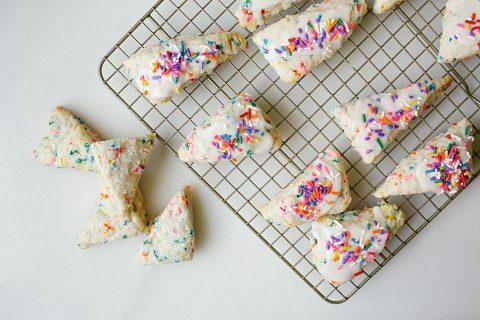 This recipe requires less than 10 minutes of prep work, so you can spend less time baking and more time enjoying these hot little numbers with the ones you love. 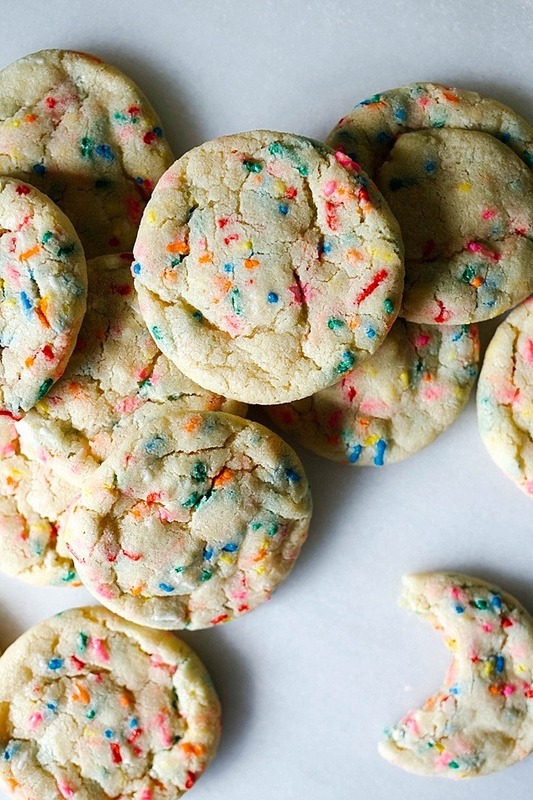 Give these funfetti cookies a try this weekend. Bake them with your kids, your bestie, or even on your own. There’s no shame in enjoying some cookie dough solo. 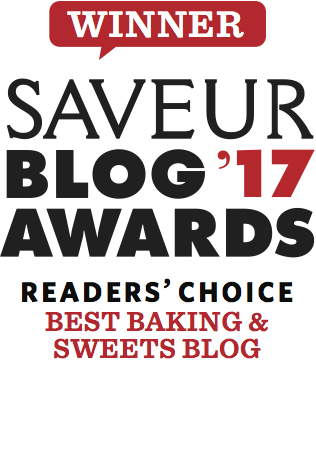 On another note, the SAVEUR blog awards are underway and I would LOVE if you would consider nominating this sweet little site. Follow the link, type in thewoodandspoon.com and consider nominating it for the “Best New Voice” and/or “Best Baking and Sweet” category. I’d adore your support. Be sure to nominate your other favorite sites too! 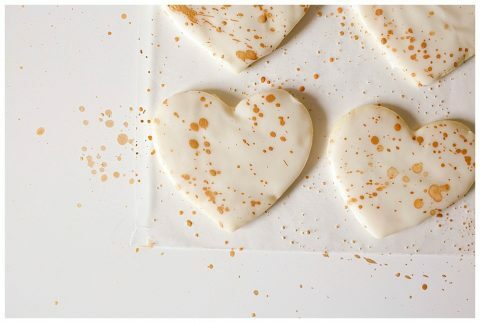 Have a terrific weekend and happy baking! 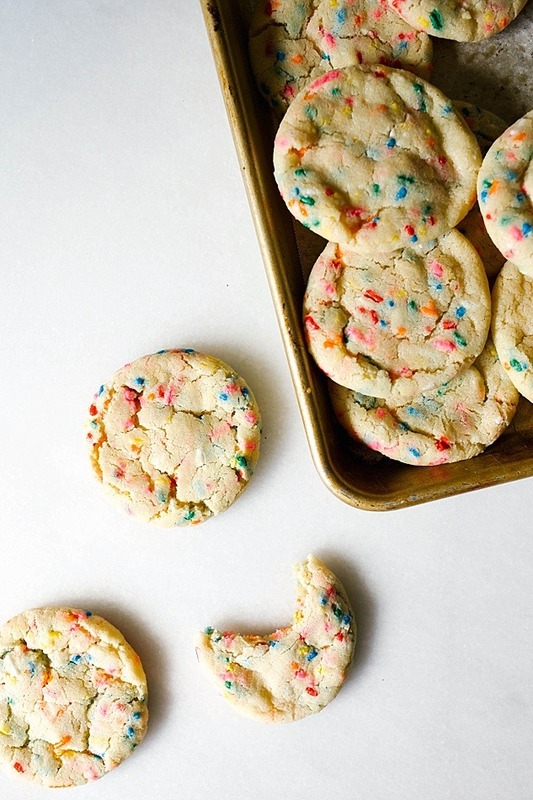 These funfetti cookies are chewy, crinkle topped sugar cookies with loads of sprinkles and box mix cake batter flavor. Preheat the oven to 350 degrees. Prepare sheet pans by lining them with silicone baking mats or parchment paper. In a large mixing bowl or the bowl of a stand mixer, cream the butter, sugar, and brown sugar on medium speed until light and fluffy, about 2 minutes. Scrape the sides of the bowl and add the vanilla and egg, beating on low until incorporated. Add the flour, baking soda, salt, and cream of tartar, and beat on low speed just until the dry ingredients are combined. Scrape the sides of the bowl and add the sprinkles. Beat just until combined. Scoop out 1-1/2 tablespoon sized scoops (I use a medium cookie scoop) and roll each dough ball briefly in your hands to smooth out the rough edges of dough. Place on the prepared baking sheets 2 inches apart. Bake in the preheated oven for about 10 minutes, or until the tops of the cookies have just begun to crack and the edges are set. Allow to cool on the sheet pans for about 5 minutes before removing to a cooling rack to complete cooling. 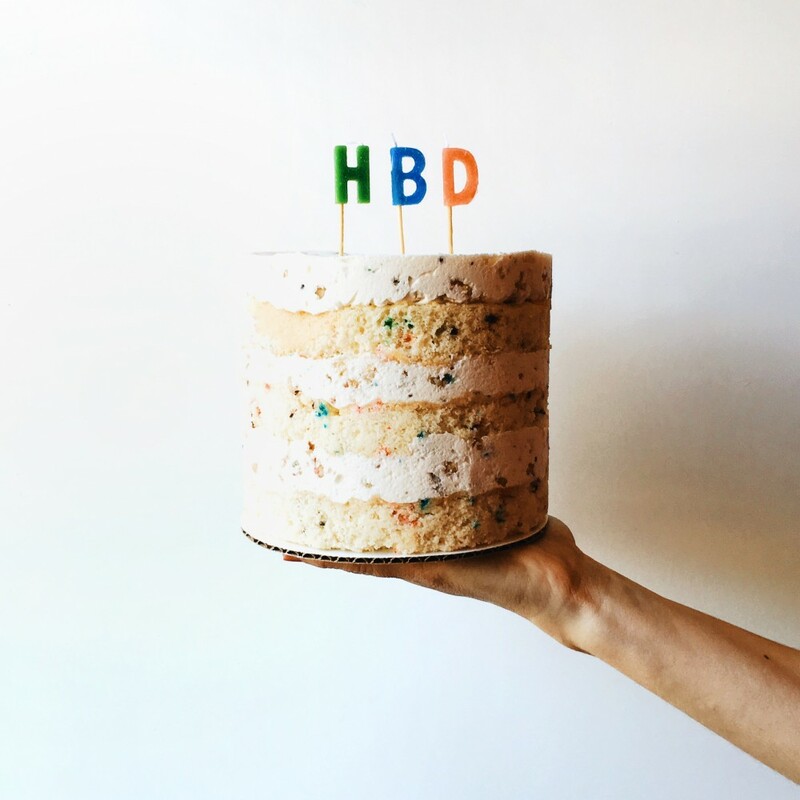 Clear vanilla extract give these cookie that classic funfetti box cake mix flavor that we all know and love. Pure vanilla extract or vanilla bean paste can be substituted, however, the flavor will differ. I used 1-1/2 tablespoon sized balls of dough for this recipe. If you use larger or smaller balls of dough your baking time will differ. Bake until the tops have small cracks running throughout. If at any point in time you dough gets too soft (or if it gets too hard in the fridge), the baking time and final appearance of the cookies may differ. If your cookies don’t spread enough, it could mean that your dough is too cold. If they spread out too thin, try cooling the rest of the dough briefly in the fridge. Just attempted baking these but it spread like crazy and just got really flat. I chilled the dough and even the baking sheet. It tastes great but I assume a crunchy/ chewy thin cookie is not what it is meant to be? oh no! I’ve not had that result with these cookies. My first thought is that the oven may run a little hot. Have you ever checked the temp of your oven or have you ever had any issue with other cookies heavily melting and spreading? YES! oh, the clear vanilla makes all of the difference in the world! oh, I hope you will! my kiddos just LOVE them. I made these cookies yesterday on a whim and they are PERFECT! They only took about 30 mins from start to finish and have the most beautiful genuine cookie flavour to them. Next time I’ll use slightly larger and more vibrant sprinkles than the small ones I had. They spread beautifully and are very even in colour. Thank you for a recipe that will no doubt be a fave of mine for a while! These taste lovely. I had to pick out the red and white sprinkles from a Christmas blend to make them more Valentine’s Day appropriate. As I said, the flavor is lovely…but I had a hard time getting these to spread. I kept the dough out of the fridge and they still didn’t seem to want to spread out. I ended up over-baking them a little while I waited for them to stop being to spherical. Any advice? I realize this post is a smidge older, so no rush on an answer! Cheers! Oh hooray! I’m thrilled to hear this! Thank you for sharing! If I don’t have cream of tartar on hand do you feel swapping baking powder in place of both the called-for baking soda and cream of tartar would work well here? If so, how much baking powder shall I use in place of these two ingredients? If not, any other recommendations to replace cream of tartar for this recipe? Thanks warmly!! Hi there! I can’t wait to see your cookies! 1 teaspoon of baking powder is equivalent to 1/4 teaspoon baking soda plus 1/2 teaspoon cream of tartar. So to be honest… I have no idea. 😉 The cream of tartar is what gives it those pretty crackles and slightly acidic taste (helps cut through the sweet! ), so I’m unsure what to recommend to you! If you have baking soda I would use maybe 1 teaspoon of baking powder and 1/4 teaspoon of soda. But truly, I’m unsure! LMK what you find! Hi Kate! Thank you so much for getting back with me, I really appreciate your educated guess here! I took your advice and feel these cookies turned out amazingly; I think the baking powder for tartar swap totally worked! I’ve never made this recipe with cream of tartar, so I can’t say that my slight variation does not affect the recipe in a noticeable way, but I certainly didn’t find these cookies too sweet! 😉 They also crackled nicely, although perhaps not as much as the beauts in these photos. Apart from that swap I otherwise followed your recipe for these scrumptious cookies. I was sillily forgetful to take a picture before packaging them up to send to my valentine, so I only have a view of them through a plastic bag, but boy oh boy, they are tremendous! I really struggled with not eating the entire batch before sending some her way! I consider my restraint a huge act of selflessness. 😉 I’m not sure how to post the photo here but would love to…? Thank you so much for this delightful recipe and your kind expert help! 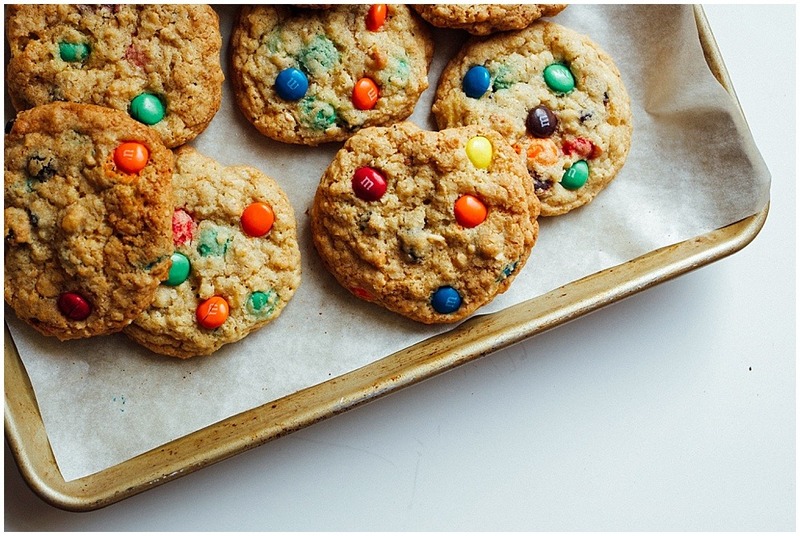 These cookies will be a staple in my kitchen without a doubt!!! I’m excited to swap out sprinkles for the next event these bake to the occasion! hooray! katie, i’m so glad to hear this!! thank you so much for sharing. sometimes swaps in recipes are tricky, and i’m thrilled to hear that you loved the outcome. very best to you! 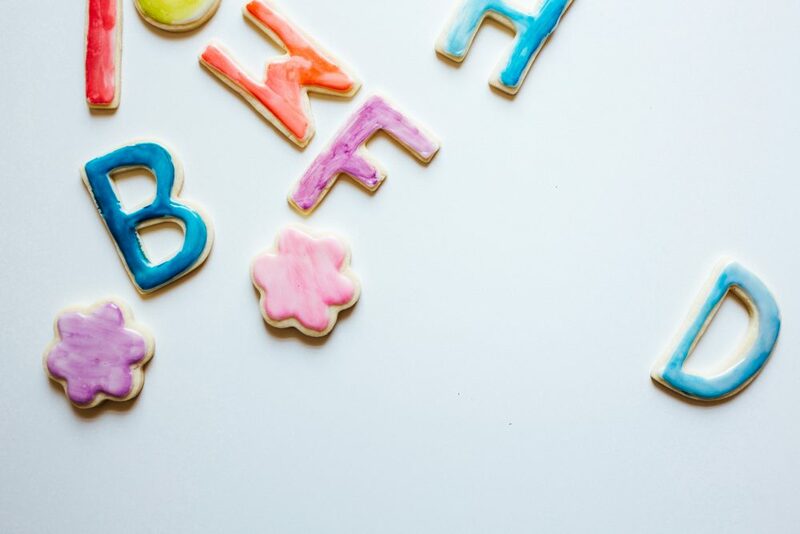 These colorful yummy cookies made for a fun sweet baking evening with my little babe!!! (We may or may not had one with breakfast today!) Delicious recipe Kate! Keep doing what you’re doing!!! I love love LOVED seeing your results. That little gal of yours is adorable. Thank you for sharing!!!! These are DIVINE!! I just made them and put chocolate chips in half the batch (I know it’s not true funfetti with chocolate chips but I’m a sucker for that chocolate!) I’ll be adding this to my list of go-to treat recipes. Thank you so much, Kate!! Wow, they are wonderful!!! So much fun, my children would love this recipe, we’ll definitely try it. Thanks for sharing! I love everything about this post! Friends who make it through those awkward years together are definitely friends for life. 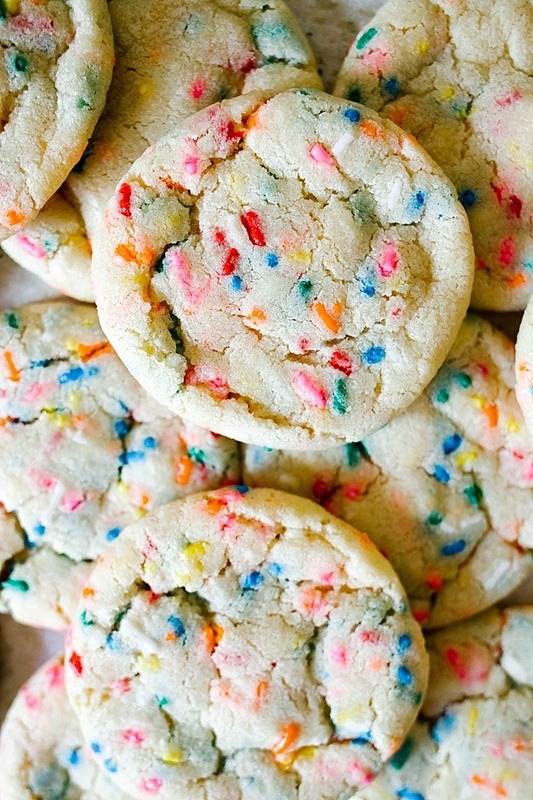 And funfetti cookies? Yes. Forever yes! you have the best photos!! 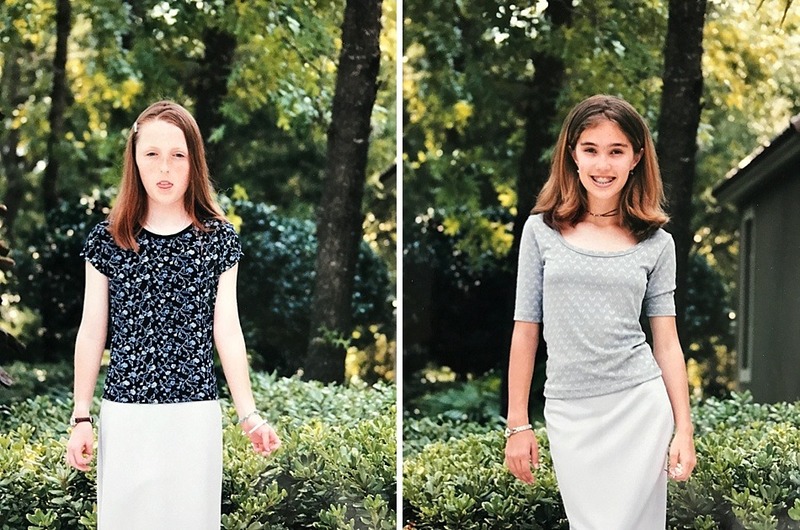 definitely wore matching mini skirts (our moms made us wear leggings underneath) with my middle school best friend to a dance, too. and that cheerleader picture looks like something out of a movie. seriously. Love how you write about BFF. That is my friend, Debbie B. Your mom knows how wonderful Debbie is too. 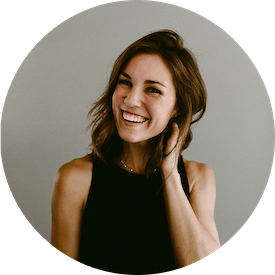 Keep blogging Kate, love you! The thought of sandwiching these with ice cream just literally made my heart stop. PERFECT IDEA.